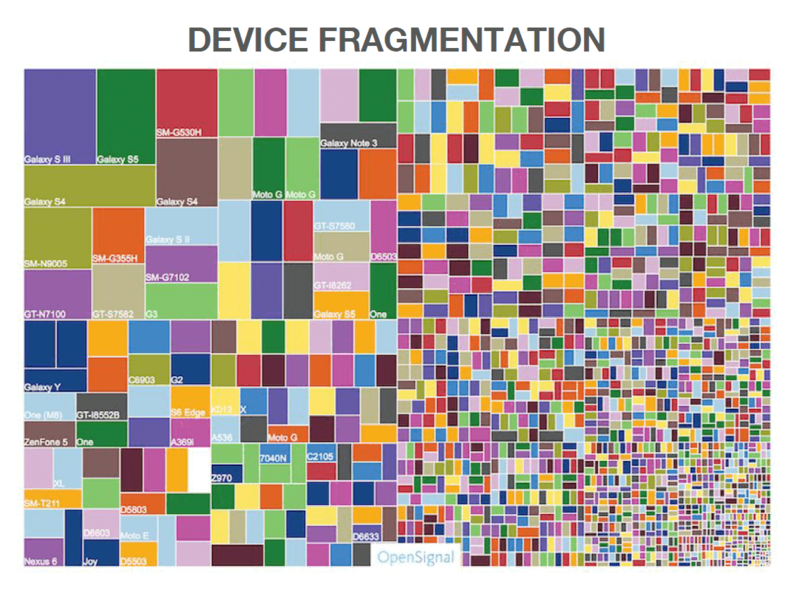 Seeing over 1000 new manufactures since 2012, OpenSignal’s latest report on Android fragmentation is a mixed bag of good and bad news. The good news is that for consumers, the choices on Android devices is greater than it has ever been. There are a wide range of devices in various screen sizes to meet your needs. For developers however, the challenge is that number of choices. The OpenSignal annual report shows a lot of interesting facts about the Android ecosystem and is well balanced on the good, the not so good and the bad. In the August 2015 report, OpenSignal states that a distinct 24,093 Android devices were seen this year, a jump of over 5,000 from 2014. That mix is made up of 1,294 manufactures globally with Samsung still the top manufacture with 37.8% of the market. Interestingly, that market share for Samsung fell from 43% last year although the OpenSignal report points out that the overall market continues to grow. to drop percipitously in usage, there is still a fair amount of fragmentation between Jelly Bean, KitKat and Lollipop. The report points out that this is not the case with iOS but of course, that is a close ecosystem with only one device manufacture so it is a bit of an apples-and-oranges comparison. having risen over the past year. KitKat still remains the dominant build in the Android ecosystem with OpenSignal seeing 39.2% of survyed devices running it. Lollipop accounts for 12.4% but is the new version since the last report. This closely reflects what Google saw in their own report that I posted on earlier this week. You can read the full report over at OpenSignal and it contains a great deal of information about Android and the overall ecosystem. Ultimately as you read the report, you will see the OpenSignal team has done a lot of work to pull together the report and it certainly poses some interesting challenges for developers.